It goes without saying that I suggested to publish these findings on my blog. Mr. Nüchterlein agreed. 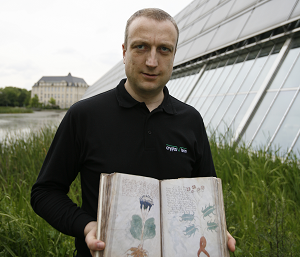 Meanwhile, he has even found over 100 encrypted pages (mainly letters) in the material he copied. These letters were written by ministers to the Austrian emperor. Mr. Nüchterlein believes that at least four different encryption methods have been used. Today, I am going to introduce excerpts from five documents that are encrypted in one of these methods. 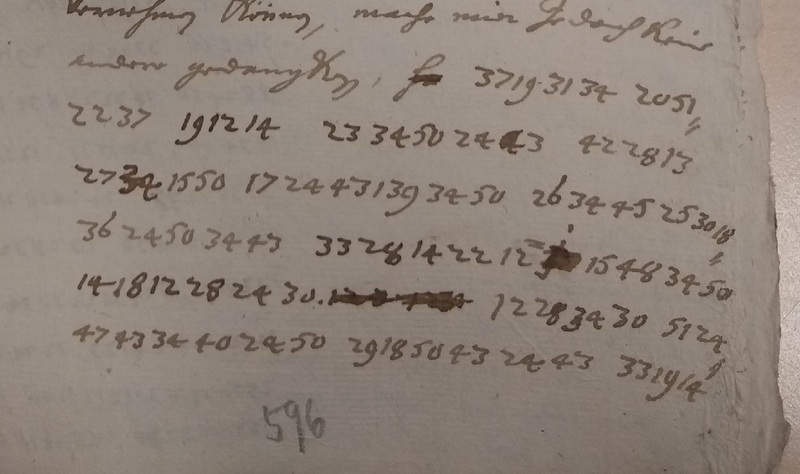 Some readers will remember that last year blog reader Thomas Ernst solved a number of encrypted letters from the Thirty Years’ War. 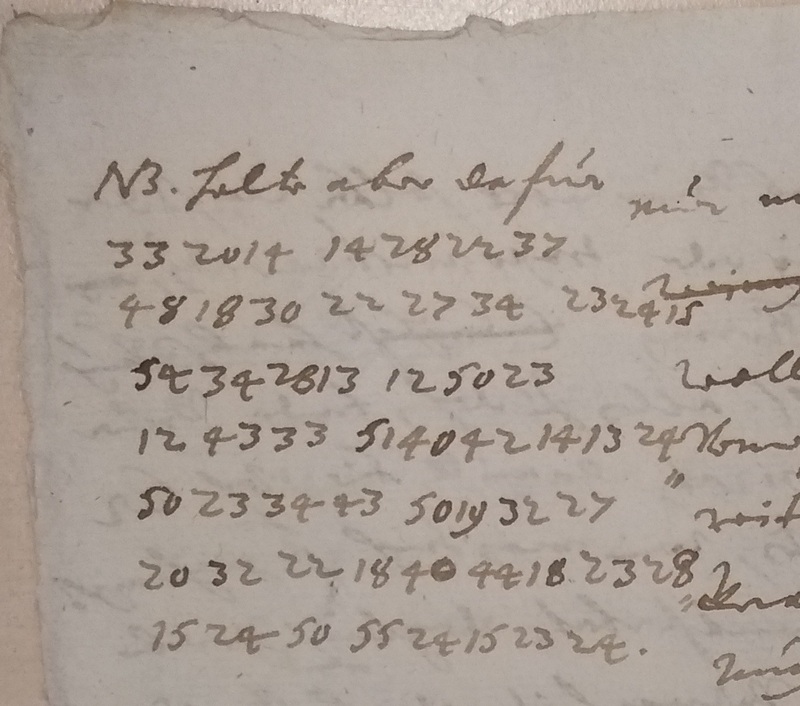 Two years ago, blog readers Christoph Tenzer and Thomas Bosbach broke a cryptogram created by Albrecht von Wallenstein in the same time period. 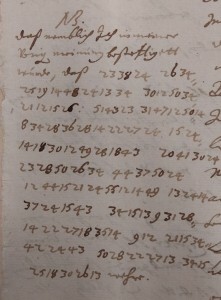 This proves that some of my readers are quite experienced in cryptanalyzing cryptograms from the 17th century. I’m optimistic that the solution of the ciphertexts Mr. Nüchterlein provided me will be found, too. As can be seen, every encrypted word consists of an even number of digits, like 332014 or 2234. This means that we probably deal with an alphabet consisting of two-digit numbers. In other words, 332014 needs to be read as 33/20/14, while 2234 is actually 22/34. 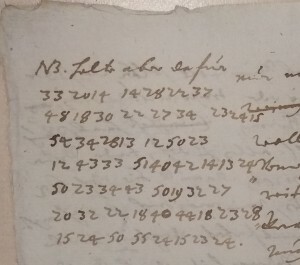 The Wallenstein cryptogram mentioned above is written in the same style. The cryptogram also contains a number of commas and colons. 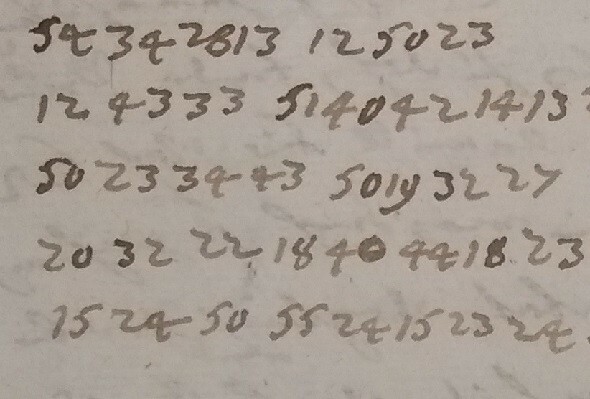 As far as I can see, none of the two-digit numbers appearing in the cryptogram is greater than 60. This means that we probably deal with a letter substitution that includes a number of homophones or nulls or phrases. 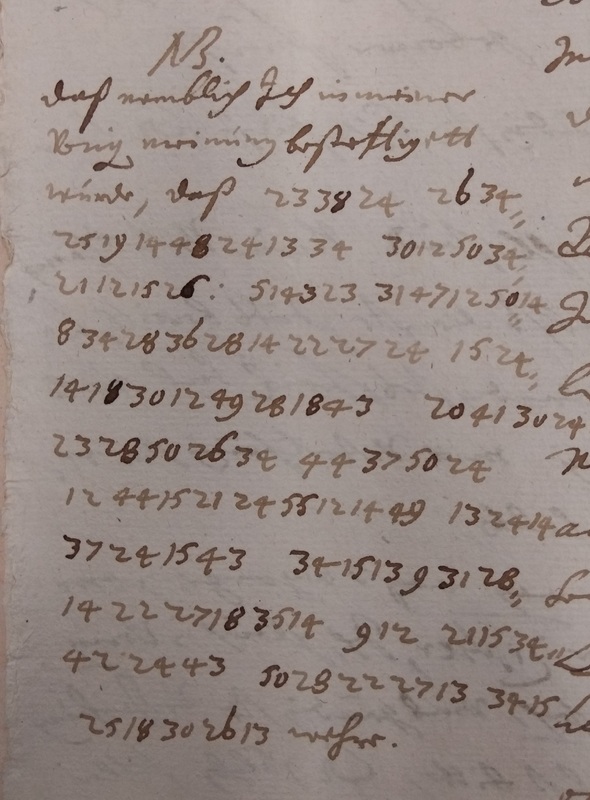 This appears to be a round of sorts in the encoding of an alphabet that is matched to a certain starting position of the alphabet. 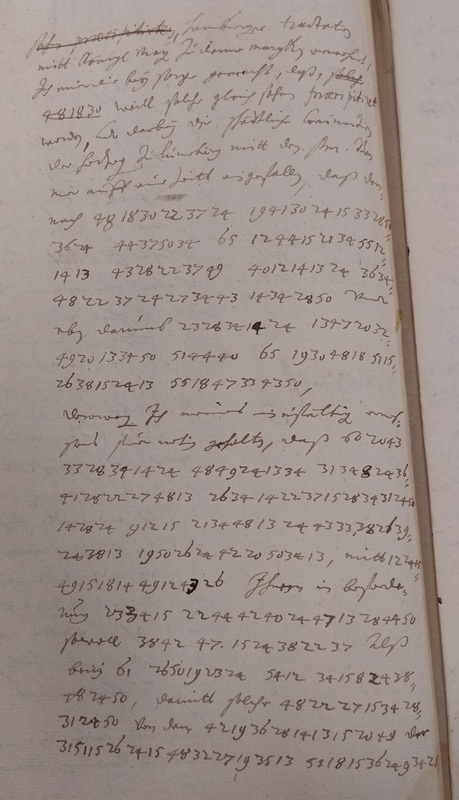 Starting at this numerical assignment A=65, the alphabet is then encoded multiple times over the array of numbers, with them sometimes repeating, but with the double bigrams covered up in each word by allowing the cryptographer to select different numerals for the same letters. The lowest and highest numbers in the first cipher are the keys to finding the placement as well. 12 is the lowest and 65 the highest. Start at A=65 and then count round to the B = 12, continuing the alphabets until the Z, and add the comma, then carry over the alphabet to the next Z and add a period. They occupy every space perfectly using two alphabets, and then offsetting them. It uses the layout of the alphabets to create the appearance of a repeating pattern and breaking the alphabets with two punctuation marks it offsets the counts even further…..simple and mathematical process of fitting two alphabets together into one numerical code. Since the numbers appear out of synch directly with the alphabets, it naturally would divert attention AWAY FROM this technique. There is also a spliced section where there appears to be some form of coding mixing letters and numbers. This may operate a second layer of a wheel cipher as well. This appears to hold a dual meaning, or that a secondary complication is added to the results of these alphabets to create the final message….. 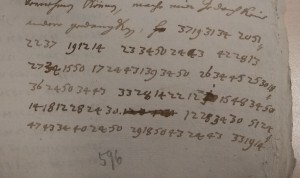 Numerical assignments in the first as shown in the link, but then possibly a ROT or another guide will be found that reveals the second message within the ciphers. Perhaps this is the second shift position of the letter Y on the Alphabet from the first layout. What a cool system to use and very easy to understand in its complications through the use of the stacked letters that act as descriptors. Love it Klaus…..you made my century. A variant of my „zifra picolominea”, for crying out loud. Yes. more material! Can’t figure out the kinks in it, yet. I suppose that “122” stands for “Friedland”, since in 1628 the emperor had given Mecklenburg including Rostock to Wallenstein, the “Herzog von Friedland”, who kept it until the Swedes captured it. It remains to find out who was “60” and 65″. Yes Thomas, that was quick indeed! Kudos! Klasse Thomas, wie hast du das so schnell hinbekommen ? Now I doubt that 112 means “Friedland”. Any ideas? what 60, 65 and 122 could mean? The link in # 10 was misleading: “Herr Pentz” was Christian von Pentz, son-in-law and advisor to Christian IV., king of Denmark. Christian of Denmark was the archbishop of Bremen (1635 – 1648) who is mentioned in excerpt II. (Erzbischof von Bremen). Pentz was also King Christian’s ambassador to the court in Vienna. 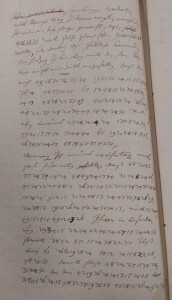 Although the excerpts don’t name the sender, I suppose it was Graf von Tattenbach-Reinstein, the Habsburg ambassador to Braunschweig who informed the emperor in Vienna about the events and negotiations in Northern Germany in 1644 (http://www.30jaehrigerkrieg.de/tattenbach-reinstein-wilhelm-leopold-graf-von-2/). But maybe Herr Nüchterlein can provide hints as to the sender? Thomas did you have an explanation for the numerous misspelled words in the translation of your alphabet. Possibly a series of nulls, but just saying isn’t that a lot of mistakes for a cipher that has been made in a professional manner? I would think it would reveal a perfect speaking plaintext that didn’t have the mistakes added? Was there a reason for the misspellings? 400 years ago the German language had a nowadays outdated vocabulary and a different spelling due to which translation software can’t recognize a lot of words. @Thomas: Congratulations, really great job! I’m absolutely impressed! I’m sure, Peter Nüchterlein will be overwhelmed, too. DIE Lösung einer historischen Chiffre des Jahres 2018! In Anbetracht solch einer Leistung kann man eigentlich nur tot umfallen … Herzliche Glückwünsche! Also dem Übersetzer erst einmal meinen Respekt und Dank, ich habe den Zahlencode mal in eigene Anwendung gebracht und siehe da, es lassen sich auch andere Code´s übersetzen. Demnächst gibt es dann über den Moderator noch eine andere Chiffrierung aus diesem Aktenconvolut.